Brachioplasty or an arm lift is a plastic surgery procedure designed to remove excess, flabby, and sagging skin folds from your upper arms. This leads to the appearance of “batwings" on your arms. Hanging arm skin folds are not only unsightly, but they also interfere with your ability to fit into sleeved tops, as well as causing underarm skin rashes and irritation. 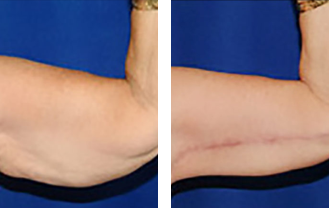 Many patients take advantage of arm lift surgery to dress how they want with more confidence. This procedure has tripled in popularity since 1997. Arm lifts can be performed on a variety of patients, including those who need minimal toning, and the best candidates are men or women who are in good health maintaining a stable weight through proper diet and lifestyle. Arm lift surgery is performed on men and women who have large amounts of loose, hanging skin on their upper arms. 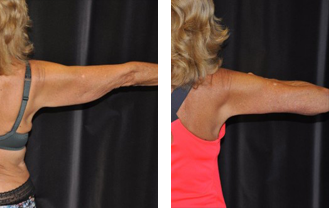 The goal of arm lift surgery is to return your arms to a more normal appearance. Although small amounts of fat can be removed along with your excess skin, an arm lift is not intended to remove significant fat deposits. Are You An Ideal Arm Lift Candidate? The majority of candidates for undergoing brachioplasty are those that have lost significant weight. While losing weight allows patients to reap many health and psychological benefits, one drawback is the sagging skin that hangs from the arms and other parts of the body following their weight loss. Many of these patients complain that their arms feel and look like wings and can restrict motion. Because the skin has lost its elasticity following years of obesity, diet or exercise alone cannot fully restore firmness and tone to the arms. Other brachioplasty candidates are those who have developed upper arm flabbiness due to the loss of elasticity that accompanies aging, genetics, or chronic tanning. Fortunately, an arm lift can help restore your ability to wear sleeveless clothing without feeling self-conscious. If you are embarrassed by the way your arms look and you are constantly hiding them with under concealing clothing, call us today and schedule a consultation with Dr. Moelleken. He will offer you the freedom of a lifestyle that you have not been able to enjoy in a long time by giving you beautifully contoured upper arms. Dr. Moelleken not only has a brilliant understanding of the human anatomy, with his surgical expertise and artistic touch he will help you realize any and all of your aesthetic goals. You should be stabilized at or near your ideal weight before having an arm lift and in cases where there are small local fat deposits with poor skin elasticity, a combination of liposuction and arm lift surgery may be recommended. Arm lift surgery, also known as brachioplasty, reduces excess skin and fat between the underarm and the elbow, reshaping your arm to a more toned and proportionate appearance. Muscle causes your arm to have a firm appearance. Atrophy of the tricep muscle, which is the muscle located on the back of your arm between your elbow and shoulder joints, can cause the body mass on the back of your arm to change from lean mass to fat. While muscle causes your arms to look firm, body fat does the exact opposite. An excess of overall body fat can make your arms look flabby because the substance below your skin is not toned or firm. Many times, the tissues in your arm relax and descend and this can be the result of many factors including aging, genetics, gravity, and weight loss. Call To Book Your Personal Arm Lift Consultation Today! At Moelleken Plastic Surgery we understand that every person is unique, and will work with you to develop a personalized approach to meet your aesthetic goals and give you the body you deserve. If you would like additional information about arm lift surgery, please call our helpful and friendly staff for a personal consultation with Dr. Moelleken today!